The operational and financial performance of a water company is inextricably linked to weather conditions. Winter 2011/12 gave us above average temperatures followed by the wettest April on record and the wettest summer in 100 years. The previous three winters saw below average temperatures, as well as below average rainfall. Indeed, the cold winter of 2008/09 saw a fourfold increase in burst pipes across the UK’s water network, and the following two winters also resulted in significant increases in leakage and pipe bursts. Clearly, the water industry needs to be prepared for all the British weather can throw at it. The winter period is a particularly challenging time of year, with the potential for heavy rainfall overloading sewerage systems or snow and ice causing damage and hindering access to assets. With climate change predicted to increase the likelihood of extremes of weather, and with the accompanying pressure on security of supply, accurate and timely forecasts, together with climate information, will be vital. 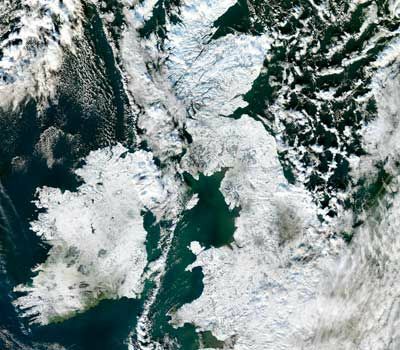 The Met Office, the UK’s national weather service, has seen a significant trend within the industry to move from post-event analysis to more proactive impact-based forecast services. Traditionally, water companies have taken services such as rainfall radar and storm analysis reports for regulatory reporting or specific studies to provide supporting evidence for their June Returns. There now seems a marked move towards tailored forecasts for key assets and across operational regions or resource zones. Tailored forecasting services allow water companies to, for example, send workmen to known operational hotspots, pre-deliver chemicals to remote water treatment works and assign more staff to the call centre to answer the public’s calls, all of which help them achieve higher customer satisfaction scores, which are monitored by Ofwat. This trend is very much in line with the industry continuing to heavily invest in the centralisation of control centres and the remote management of systems using telemetry and Scada. This centralisation of operations is a natural vehicle for the adoption of weather intelligence systems. This can take the form of visualised systems layered on, for example, Google maps or direct feeds into water companies’ own operational systems displayed via some form of management dashboard. Stephen Herndlhofer, manager of risk and analytics at Yorkshire Water, says: “The risk from extreme weather to the operational and financial performance of our business, as evidenced by recent events, appears to be increasing. The effect of weather on a water company spans all its operational activities, from customer call handling, through demand management, sewerage resilience, water production, energy, health and safety, and network resilience. It therefore makes sense to study each of these business areas independently, but with the overall organisational needs in mind to develop a cross-company service. It is vital to gain a detailed knowledge of weather thresholds in relation to business impacts, and in turn to apply these to business processes. Mitigating activities against weather impacts is a crucial aid to water companies in planning resources, managing assets, and improving customer satisfaction. Furthermore, having a structured approach enables a cost-benefit analysis to be undertaken, establishing whether a clear return on investment is achieved through the adoption of weather forecast services. Earlier this year, the Met Office and Thames Water brought their two areas of expertise together and signed a joint agreement to launch a suite of weather intelligence models for the water industry. Companies that use the new models will gain access to four operational and strategic weather intelligence models, enabling the impact of weather on leakage, bursts, demand and seasonal night use to be understood and mitigated. They can use these models to make operational resourcing decisions and cost savings, and to manage risk across the water distribution network. Take the burst model, for example. This uses weather forecast information to calculate the number of bursts across a region, enabling network managers to target resources in areas of high risk. It can also be used in conjunction with the leakage model to provide a complete winter modelling service. This can calculate the effects of cold and dry weather on leakage by using weather scenarios to predict changes in water loss and enables companies to test their management plans. This will help avoid unnecessary and costly leakage reduction activity. In addition, the Met Office’s “nowcasting” and rainfall radar services enable water companies to view fine resolution radar images – down to 1km and updated every five minutes – so they can respond quickly if showers and thunderstorms or prolonged spells of heavy rain develop at any time of year. Our continued aim is to work in partnership with water companies to combine weather information with water industry data so that proactive decisions can be made when adverse weather is forecast. We can offer both consultancy and continuing operational services, providing an understanding that really helps the industry explore what to expect from weather conditions now and in the future — and how best to face them.